Have you met Christen yet? Christen, a member of the 14th Street Y is getting married this fall. Besides wanting to look her best for the wedding, Christen wants to have a sustainable, healthy plan for exercise and eating that she can feel good about her whole life. She has graciously agreed to let us blog about her workouts so that you can join her on this healthy journey, and get some great workouts and ideas for your own program. 15 minutes interval training on the elliptical. -4 min warm up in heart rate zone 1. -Flexibility, balance and relaxation: at least 1-2 times a week: Yoga, Qi Gung, Tai Chi -Cardiovascular endurance and efficiency: at least 2 times a week. -Resistance Training: 3 times a week. Questions about this workout? Leave a comment here! We hope you’ll try it and let us know what you think. Mostly though, if you’re reading this on our website then you’re probably seeing the two things we’re most happy about. To your right, a schedule of everything that’s happening in the building today. Need to remember if Pilates starts at 10 or 10:30? Just go to the homepage and check the daily schedule. Everywhere else, you’ll find gorgeous photos of our best thing- our members and friends- playing, laughing, sweating, learning, swimming, creating and being a part of this wonderful corner of the East Village. Welcome to the brand new look of the 14th Street Y! Congrats to MT Works and the cast and crew of Parts of Parts & Stitches on their glowing review in Backstage! For the entire review, visit Backstage.com. Our next show at the Theater at the 14th Street Y starts tonight. Parts of Parts & Stitches takes place in Pakistan in the year 1947. A joyous wedding turns into a time of violence, and the plays uses magical realism to bring horrific events to life. Award winning playwright Rita Sachdeva, a member of the Public Theater’s Emerging Writers Group, sat down with us to tell us more. The Y: What’s the show about? Sachadeva: The play is set in 1947 during the partition of Pakistan and India. It’s about a community that had lived together for generations, then political profiteers created tensions between Hindus, Muslims, and Sikhs and those “tensions” erupted into mass violence. It’s about the protagonist’s shock of the physical and psychic displacement. The Y:	Why bring this show to the Theater at the 14th Street Y? Sachadeva: The theater is beautiful and big enough to hold fourteen characters and an epic story. As the YHA, the community here may identify with the loss of land and community, given the history of Jewish people being expelled from so much of Europe; and the community may also resonate with the history of being allies to those who are being persecuted, given, for example, the history of Jewish-Americans support of the Civil Rights Movement. The play deals with divisions and also highlights those who cross the religious boundaries to save each other. The Y:	What makes this show relevant? Sachadeva:	It’s the 65th anniversary of the partition this year. Beyond that, the story of partition is one that exists around the world – from gentrification of communities in New York to Israel/Palestine. We grapple with issues of “loyalty,” “enemy,” “duty” in our daily lives and contemporary partitions. We struggle against the imperial/colonial strategies that divide people who are otherwise willing to live side by side. Sachadeva:	MTWorks is committed to producing new plays and challenging their comfort zones. By choosing this play they are acting on their willingness to do the difficult, sometimes awkward cross-cultural work of learning history and culture they are not familiar with and networking with artists and audiences who they had not yet worked with. 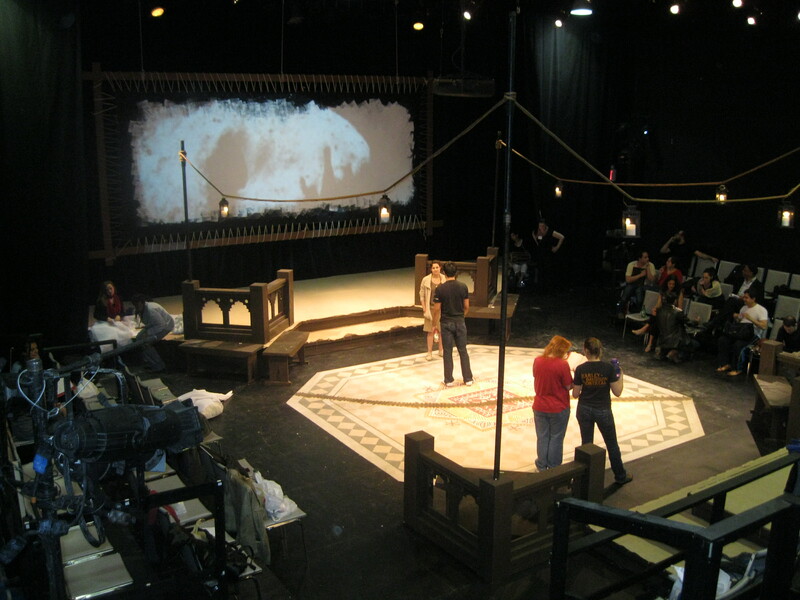 At a theater level, they are doing the work that the heroes in the play do. For more info, visit the 2nd floor theater lobby for a postcard, or visit http://www.mtworks.org. Try our BUFF BRIDE Workout! Our Buff Bride Christen worked with Jordan last week with exercises that addressed strength, balance and core. Here’s what she did this week. Warm Up:Opposite Arm/leg reach: Balance on all fours in a kneeling position, and slowly reach out opposite arm and leg. This stretches and strengthens the lower back, engages the core and warms up the arms and legs. Prone Cobra: Lying on your stomach, slowly raise both arms and legs while engaging your core. Again, strengthening and stretching your back and engaging your core. Dumbbell Squat to Press: Christen used 8 lbs in each hand, and 15 reps for each set. For all these exercises, choose the weight that allows you to do 15 reps, working to fatigue. Dumbbell Chest Press: Christen used 15 lbs in each hand, 15 reps for each set. Machine lat Row: Christen used 25 lbs, 15 reps each set. After working through this circuit 2 times, Christen moved to the elliptical trainer for her cool down. Repeat 3x, then cool down for 2-3 minutes. Sunday, March 11th marked the one year anniversary of the earthquake, tsunami and destruction that hit northeastern Japan. Many in our own community were deeply affected as they worried about their relatives, friends and homeland. As the Y continues to think about ways to be green, we acknowledge the reasons why. Reprinted today from The Atlantic, their deeply moving photos and article about Japan, one year later. 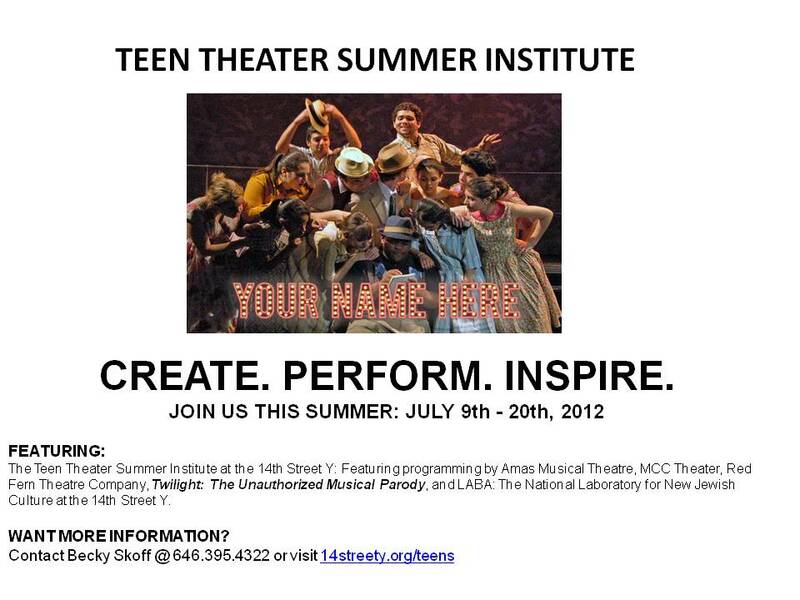 This summer- our first Teen camp is coming to the 14th Street Y! The 14th Street Y’s artist fellow program, LABA, the National Laboratory for New Jewish Culture, joins with top downtown theater talent to offer a unique teen theater experience in the heart of New York’s East Village. Only blocks from where Jonathan Larson was inspired to create his modern day Bohemian characters from Rent, the 14th Street Y is the home of a state of the art black box theater and arts program. Also a home for innovative Off-Off Broadway theater companies, the 14th Street Y is joining with some of our community partners to bring the downtown theater experience to New York teens. For two weeks, teens will study with Theater experts from a variety of fields and perspectives. LABA artists will bring their experience with ancient texts, providing inspiration for contemporary work to the teens in a series of workshops. Programming by Amas Musical Theatre, MCC Theater, and Red Fern Theatre Company will provide discipline-specific instruction in the areas of musical theater, acting, playwriting and theater for social justice (or Tzedek). Teens will be able to customize their program with the choice of classes and focus. TTSI is the only summer program where teens can get a variety of expert instruction from award-winning theater companies, plus cultural programming from innovative 14th Street Y artists, in one place. While we incorporate Jewish Values, you do not need to be Jewish to attend! Our programming is open to all who wish to participate, and all LABA programs take place in a non-denominational, non-religious setting. Teens participating in the TTSI will receive a Summer Teen Membership to the 14th Street Y, which includes more than 40 fitness classes a week, and access to our gym and pool. All registration forms are available : www.14streety.org/teens.